All new Elegance Grande 635 has landed, This high spec caravan is bursting with luxury, featuring a transverse island bed set in an end bedroom, large centre Washroom, and a spacious living area all set in a totally timberless framed bodyshell and new revolutionary floor giving a lifetime water ingress warranty. Welcome to Pedleys Caravans & Leisure offering a unique service from our family owned business, boasting over 51 years of caravan sales and service based in the heart of the UK. Why buy from Pedleys Caravans & Leisure? 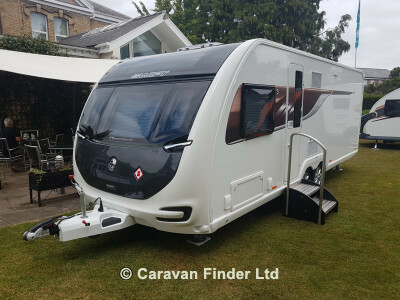 -	We offer a large amount of well-presented stock with the latest brand new caravans offering Swift, Sprite, Xplore and Elddis models. -	Our AWS approved workshop offers highly trained caravan technicians servicing all makes and models of caravans including habitation services on Motorhomes. -	Conveniently located in the centre of England allowing easy access via M1, M6 and M42 making us an easy to reach dealer no matter where you are in the UK. -	One to one handover of your new caravan with a trained specialist teaching you all you'll need to know. -	High security CaSSoA Gold caravan and motorhome storage with access available 7 days a week. -	On Site leisure shop offering you the best advise on accessories and awnings along with a superb selection to choose from. Here at Pedleys Leisure we pride ourselves on excellent customer service making us the perfect choice for your next new or used caravan purchase. We look forward to meeting you from all the team at Pedleys Caravans & Leisure. If you have any questions please do not hesitate to call Roger on 02476 644883.